« It’s National Postdoctoral Appreciation Week! Symposium Chairperson Juan Garcia recaps the 2018 Postdoctoral Research and Career Symposium and gives a nod to the 2019 Co-chairs. The Postdoctoral Society of Argonne (PSA) held the Annual Postdoctoral Research and Career Symposium on November 8, 2018 at the TCS Conference Center. 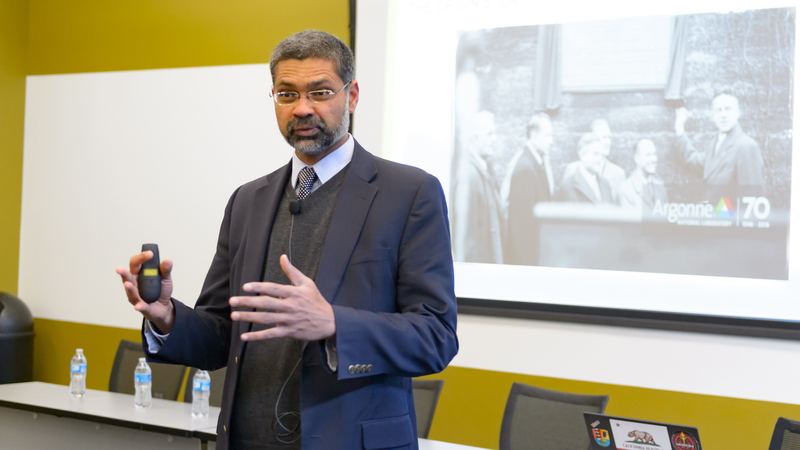 The event successfully highlighted the research performed by Argonne postdoctoral researchers. It also allowed the participants to network with industry, research institutions and academia. This provides postdoctoral researchers with an opportunity to understand different career path and engage in long lasting professional relationships. Symposium Chairperson, Juan Garcia, CSE, opens the 2018 Postdoctoral Research and Career Symposium. Interim Associate Laboratory Director for EGS, Suresh Sunderrajan helped start the day with welcome remarks. 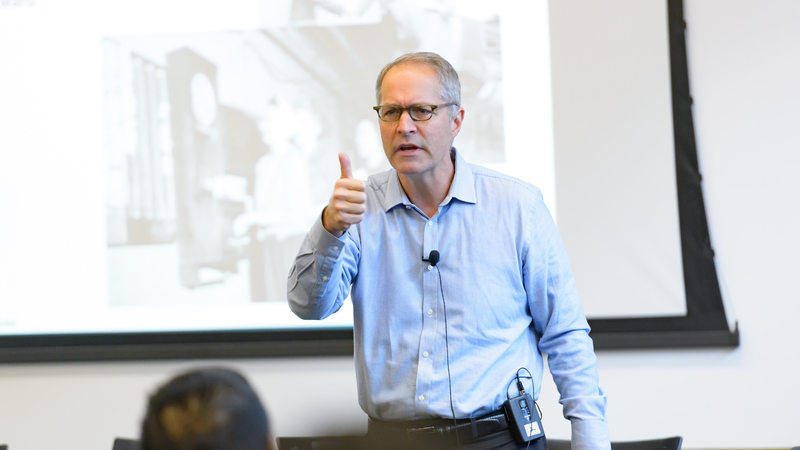 The keynote speaker, Peter Fiske, is the director of the Water-Energy Resilience Research Institute at Lawrence Berkeley National Laboratory. Fiske has experience with research, entrepreneurship and management. He shared his thoughts on career development for scientists. He provided key insights on the evolution of academia and the challenges and advantages of PhD holders. He highlighted PhD’s transferable skills and personal qualities that make them suitable for many different career path. His speech resonated with the audience which engaged in a vibrant interchange of question and answers that went for hours after the end of the formal talk. 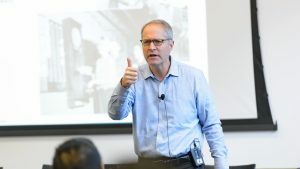 Peter Fiske, Director -Water Energy Resilience Research Institute (WERRI)- Lawrence Berkeley National Lab, gives postdocs a thumbs up during his Keynote address. This year a networking lunch provided symposium participants with an opportunity to engage with industry, academic and laboratory representatives in an informal networking environment. The companies gave a good insights in their work” said Max Gebhard from the organizing committee. “I got to understand opportunities at those companies, which definitely helps to identify potential employers in the future” he remarked. Panelists included Ksenija Glusac, associate professor of chemistry (UIC) and scientist (Argonne); Joe Bernstein, senior director, Financial and Grant Services (UChicago); Jonathan Logan, scientist (Alcorix Co.); and Shalaka Shinde, senior scientist (Oil-Dri Corporation of America). All these panelist have Argonne in their history. Yet, their careers went to completely different directions including academia, administration, startups and industry. 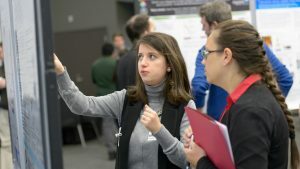 Poster Award Recipient Selin Sariydin (XSD) walks through her poster with a symposium participant. Poster Award Recipient, Nwike Iloeje (ES) discusses his research with a symposium participant. Poster presentations were judged for overall poster appearance and quality, topic organization, clarity and significance of illustrations and knowledge of topic. “We all have heard about career opportunities and transferable skills before, but this event put everything together in a compelling and really eye opening perspective. 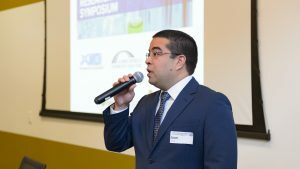 I think this learning experience is invaluable to complement the Postdoc experience in Argonne” said Juan Garcia, the Symposium Chairperson. 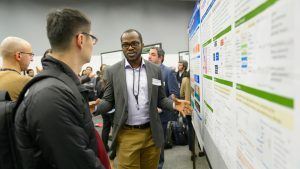 The Postdoctoral Society of Argonne (PSA) is working in other efforts to help the postdoctoral community shine. This year’s Symposium Co-chairs are Max Gebhard (AMD) and Ahmed Farghaly (CSE). Want to help make this year’s symposium something special? Contact Max and Ahmed at mgebhard@anl.gov and afarghaly@anl.gov. This entry was posted in Career Corner, Distinguished Fellowships and Divisional Postdoctoral Appointments, Events and tagged careers, Postdoctoral Research and Career Symposium, research. Bookmark the permalink.